Today I will look at Waldorf Education as a possible homeschooling method.The Waldorf Education movement was started by a man called Rudolf Steiner in Austria circa 1920s. Steiner was employed to teach the children of factory employees, and from this he developed his philosophy of Anthroposophy, which is said to be an enhanced link to the spiritual which can be nurtured in children by a child-centred learning environment. Steiner believed in teaching the whole child, hence the Head, Heart and Hands Waldorf slogan. In a Waldorf environment, daily rhythms are strongly encouraged, as are saying verses, singing and many forms of art and creative expression. Wearing natural fibres, eating well and participating in community-based living are all encouraged in Steiner based schools, and a faculty of parents exists in place of a principal. As a family, we have used some Steiner resources, which tend to be beautifully made, and the stationary supplies are gorgeous, if a bit costly. Reverence for young children and the magic of childhood is quite apparent within the Waldorf curriculum, as is mindfulness in the everyday. Personally I have found a strictly Waldorf curriculum somewhat formulaic and I feel it requires a lot of dedication to the ritual side of things. Having said that, it is an amazing, worthwhile resource and if you have the desire (and discipline) can be immensely rewarding. Patterson, Barbara J & Bradley, Pamela. 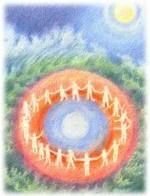 Beyond the Rainbow Bridge: Nurturing Our Children from Birth to Seven. Michaelmas Press, 2000. Baldwin Dancey, Rahima. You are your Child's First Teacher: What Parents Can Do with and for Their Children from Birth to Age Six (Early Years). Celestial Arts, 2008.